LAHORE: Government of Pakistan’s official Facebook page on Thursday secured a spot among the “Top 10 Most Active Governments on Facebook”. According to a globally reputed study conducted by Burson Cohn and Wolfe, and first shared by Twitter handle @Twiplomacy, the Pakistani government has been named the seventh “most active world leader” on the social networking giant with 6,875 posts in the year 2017 and an average of 16 updates per day. 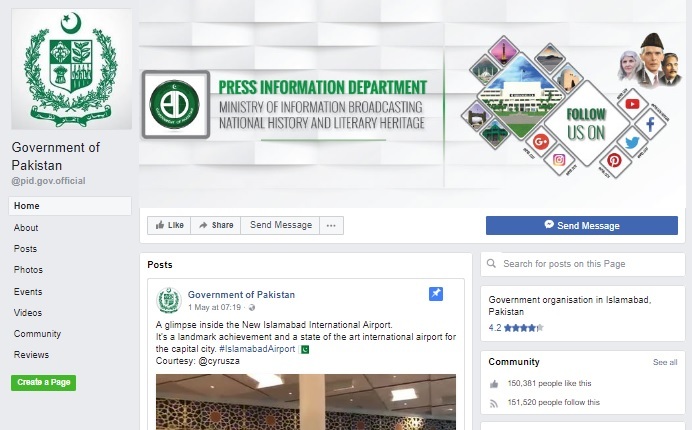 It is worth mentioning here that the proactive behaviour of the country’s government organisations on social media has reached a new high within the past seven years with the government aiming to “revolutionise” the Information Technology (IT) industry, especially in Punjab. Some of the laudable acts of the incumbent government include the establishment of the Dr Umar Saif-led Punjab Information Technology Board (PITB) that has assisted not only the federal government at instances, but also brought about the much needed reforms in the world of IT in Pakistan while digitising records, providing ease of access to the people and leaving the country’s digital footprint in the modern IT world. The Botswana government tops the said list with 15,251 posts, while the government of Pakistan is preceded and succeeded by the governor of Puerto Rico, Ricardo Rossello (6,949 posts) and the Russian Foreign Ministry (6,035), respectively. In a separate list by Twiplomacy, United States President Donald Trump has been named “The Most Interactive World Leader”, with Indian Prime Minister Narendra Modi securing the second place in the list. Meanwhile, Canadian Prime Minister Justin Trudeau, in the list sits at the seventh position. According to the list, Donald Trump posts an average of five times per day, more than twice as much as the Indian prime minister and, since January 1, 2017, his page has accrued 204.9 million interactions (comments, likes and shares), almost twice as many as Narendra Modi with 113.6 million interactions. On Wednesday, another study named “World Leaders on Facebook” by the same organisation had said that Prime Minister Narendra Modi was the most “liked” world leader on Facebook, much ahead of US President Donald Trump. It may be noted that Twiplomacy, introduced by Burson-Marsteller, aims to promote Twitter diplomacy by helping governments and international organisations with digital strategies. It publishes instances of digital diplomacy among world leaders and supports the use of social network by heads of state, leaders of intergovernmental organisations and their diplomats to conduct diplomatic outreach and public diplomacy. Twitter has taken on diverse and occasional roles in diplomatic communications, from cordial announcements of bilateral cooperation to terse exchanges and diplomatic jabs, as well as more casual posts.